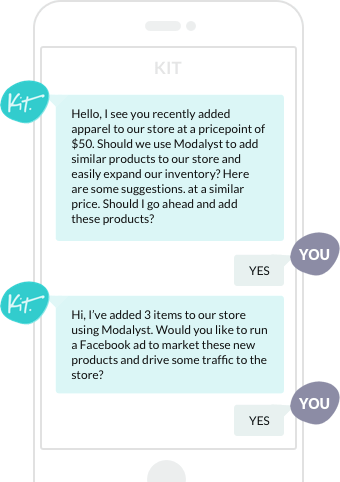 Once you register for Modalyst, you can sign up for Kit and start receiving our product recommendations. Kit is only available for Shopify stores. Get used to hearing this all the time. Modalyst recommends products and adds them to your store, upon approval. Kit markets your store through SMS, Facebook Messenger, or Telegram. Just say “Yes.” Modalyst & Kit handle the rest. Modalyst has all the tools and functionality for an online store to source, list and sell a large array of differentiated products, with zero upfront inventory costs - all automated with ease. Choose as many product as your bandwidth allows. There is no such thing as shelf space in the virtual world! Start for free. No credit card required!